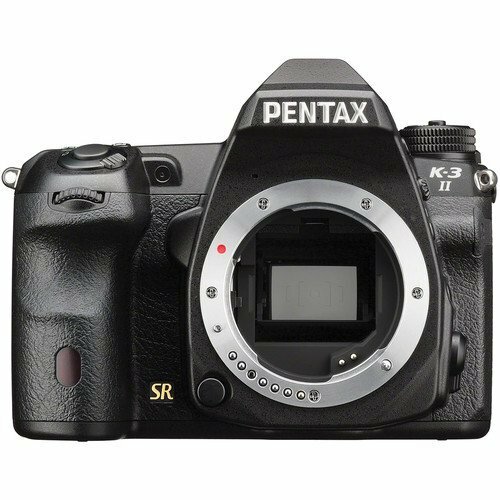 Utilizing enhanced image processing and sensor-shift Shake Reduction technologies to their fullest potential, the K-3 II from Pentax is an advanced DSLR optimized for both high-speed and high-resolution shooting. Featuring a 24.35 MP APS CMOS sensor and a PRIME III image processor, this camera is capable of shooting up to 8.3 fps, full HD video recording, and has a sensitivity range from ISO 100-51200. Benefitting the image quality is a selectable anti-aliasing filter, which can be turned on or off to either garner the highest resolution and sharpness possible or provide enhanced protection against moiré, and the in-camera image stabilization compensates for up to 4.5 stops of camera shake for sharper imagery. This sensor-shift design further lends itself to the Pixel Shift Resolution function, which composites four separate exposures into a single frame while moving the sensor in one pixel increments between each shot in order to gain truer colors, greater resolving power, and reduced noise. Also making use of the sensor-shift mechanism, an AstroTracer function utilizes the in-camera GPS module along with the shifting sensor to compensate for the Earth's rotation and minimize the appearance of star trails when photographing the nighttime sky.